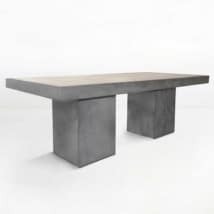 Teak Warehouse has an amazing and eclectic selection of concrete dining tables. 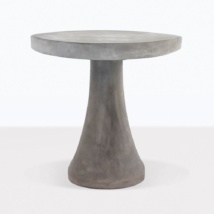 We sell round concrete dining tables for 2 people or square concrete tables for 4 people. 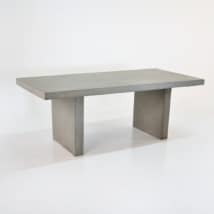 The main concrete dining tables we sell and are the most popular are the Raw Concrete Rectangle dining tables. 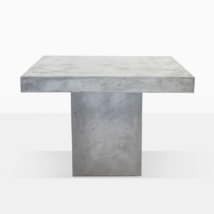 These rectangle concrete dining tables have sizes that can seat up to six, eight or ten people. 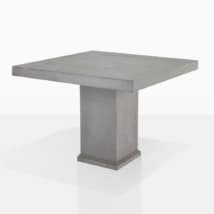 Over the last 6 years we have developed a concrete table that is perfect for outdoor dining, easy to maintain and also looks so cool and sophisticated. 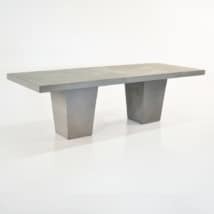 We love the look and fit that Concrete Dining Tables has with so many different styles of dining chairs. Examples of this are the new fine outdoor wicker dining chair in black or white. Green also looks amazing for fun, or mix up the chair colors to impress you friends with your brave design skills. Our outdoor teak dining chairs look beautiful with the outdoor concrete dining tables. Maintaining the outdoor concrete is easy and should be done immediately after spills. It just needs to be treated with cleaner that you use indoors or outside. We carry a lot of accessories in concrete to add to your new concrete modern style like candle holders, bowls, and planters in all shapes and sizes. So for all the needs for outdoor concrete Teak Warehouse is the place to go. All tables are inspected and wrapped for delivery. 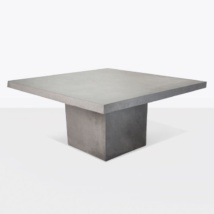 All concrete tables are delivered and placed in the area you wish it to stand in. This placement is permanent. If for some reason you need to move your table, then we recommend 4 strong people pick it up and then move. Dragging the table along the floor will cause damage to the legs and the underside of the table. And is not covered by warranty. If you require your table to be delivered, it is important to advise where you are living as the table will need to be carried into your property. The weight of the table is important and needs to be placed on an area where the ground or patio will be able to bear this weight, this is important for safety. Consult a builder to recommend suitability if you have a difficult passage way for delivery. Please advise if you live in the top or middle floors of a building, advanced notice is required of your delivery people.